Bill de Blasio's Dante ad: How he won without a single piece of snail mail. 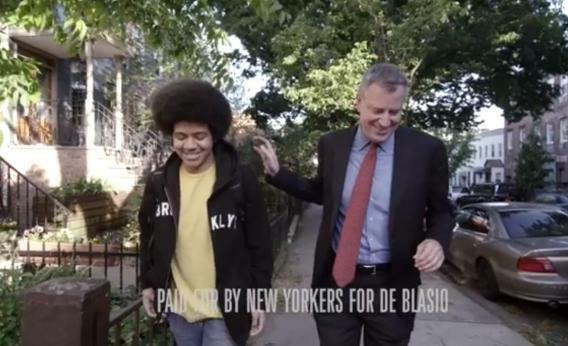 In an enormously popular TV ad, Bill de Blasio’s 15-year-old son Dante talked about how the candidate would oppose the police department’s “stop-and-frisk” policies. The part that’s widely known is that his campaign took off with the help of a wildly popular TV ad featuring his son Dante (see below). Less widely known is how he afforded that TV ad blitz: by cutting corners everywhere else, including salvaging free furniture from Craiglist for the campaign’s “disgusting” Brooklyn headquarters. Traditionally, New York City candidates pour tens of thousands of dollars into glossy, micro-targeted brochures offering customized appeals to lure groups like Caribbeans, Chinese immigrants and observant Jews to the polls. In July, when the campaign staff met, its members rejected that idea, deciding against sending out a single piece of mail and pouring that money into television — a decision even Mr. de Blasio’s director of mail endorsed, at no small cost to his business. That might not sound radical to those unfamiliar with modern campaigns. After all, a lot of people are eschewing snail mail these days. But campaigns have been loath to do so, even in the social-media age. That’s not because they like the medium itself, but because, as Barbaro suggests, it’s a way to do what’s known in the business as “microtargeting.” Via mail, you can send messages carefully tailored to small fragments of your constituency without having to worry too much about alienating everyone else. As Sasha Issenberg chronicled in his book The Victory Lab (and an accompanying Slate blog), ever-more-advanced forms of microtargeting have been critical to recent elections, including Barack Obama’s 2012 victory over Mitt Romney. But that’s not what de Blasio did. His television ads weren’t about piecing together a coalition, block by block, nor about targeting single-issue voters with emotionally loaded attack ads in a bid to puncture his rivals’ coalition. Rather, the “Dante” ad was an example of a very different artifact of present-day media technology: the feel-good viral video.